At Bitplane, we are constantly developing the existing capabilities and adding new features to the Imaris package. We listen carefully to your feedback and work to bring you the most advanced image visualization and analysis tools. 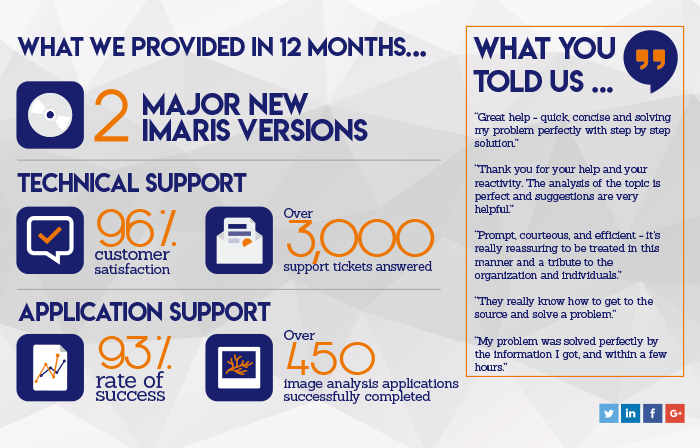 The Imaris Infinity subscription ensures you will always have access to the latest Imaris version as well as expert technical and application support. The early bird offer means you can now get your Imaris Infinity subscription at a reduced cost when you place your order before your previous contract expires. The loyalty scheme will gradually reduce the cost of the Imaris Infinity subscription per license for each consecutive year the license remains covered by the Infinity subscription.